This months featured package is the Snow Cones 220v starter package. Because we like to keep things simple at The Shave Ice Company we have put together a start up package for those wanting to get shaving right away. 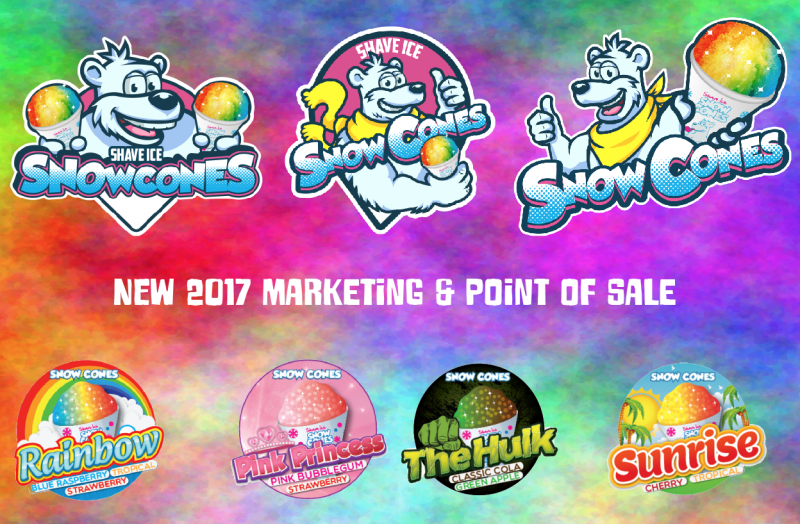 Snow Cones is a fully established hugely popular brand. Developed for customers who requested a smaller portion size to serve their customers and is aimed at the younger market, the small retail price allows for pocket money purchases to be made. Ideal for small convenience stores, locations near schools or children’s play areas etc. A 220v Sno-maker 4000 Ice shaver machine. 24 litres of our amazing Shave Ice syrups. Assorted flavours. Fantastic striking new 2017 Point of sale poster pack. Fantastic striking new 2017 Point of sale sticker pack. A tub trug for ice storage. A spare blade for your Sno-maker 4000 Ice shaver machine. Including free delivery to the UK and Europe. We have all bases more than covered with this start up package. Not only will you have all the best equipment available. You’ll also look the best with superb striking and eye catching point of sale materials featuring our massively popular child friendly mascot ’Snowy the Bear’ that are included, and we know you’ll certainly look the part yourself in our cool Snow Cones t-shirts and Baseball caps, although wearing those is optional, of course. The only things not included in this package are a gazebo/stand to trade from, but fear not if you require one then we’ve got you covered, please contact us for more information regarding retail solutions. The other item that’s not included is of course the bags of ice….but you’re on your own with that one. Although we can recommend where best to source your ice and the best ice to use, in-fact we have a whole blog post dedicated to Ice here. Exclusive online savings when you quote ’Snow Cones package’ when ordering. Don’t miss out on this fantastic package and join the Shave Ice family today. PrevPreviousThe importance of tempering Ice.